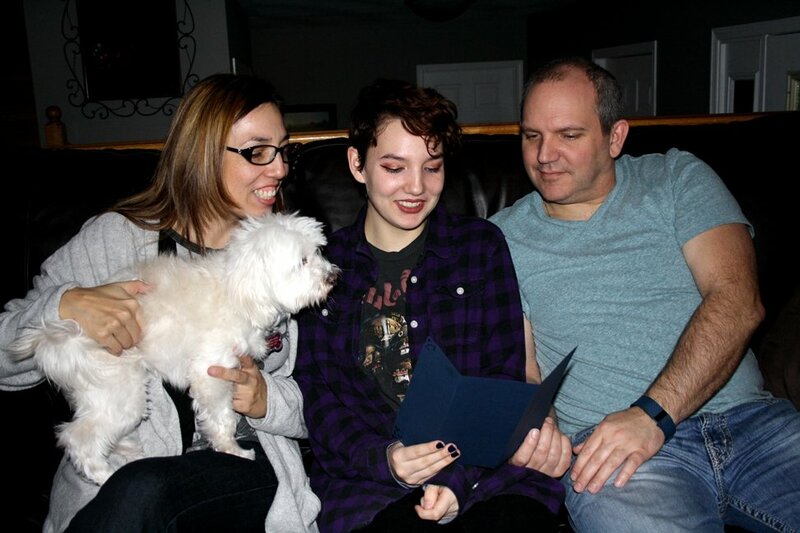 Sara Gardner, 17, reviews her invitation to attend an open house at Laurentian University with her parents Lisa and Andrew. The shy, petite 17-year-old member of Whitefish River First Nation loves to solve problems, and physics is her game. Sara Gardner is one of a lucky group of people to be heading this spring to the U.S. Space and Rocket Center Camp Program in Alabama, U.S.A.
Sara and her family couldn’t be more pleased. Her mom Lisa came across the program through her work at Honeywell, which invents and manufactures technologies around energy, safety, and security. Youth between the ages of 16 and 18 and children of Honeywell employees have the opportunity to be sponsored through the Honeywell Leadership Challenge Academy program. He also envisioned an experience for young people who were excited about space. Sara decided to jump at the chance to attend the space camp and is excited about it. Through this once-in-a-lifetime opportunity, Sara will undergo a variety of astronaut training exercises, engineering challenges, and teambuilding activities, topped off with an extended-duration simulated space mission. Some of the activities include training like an astronaut on a 1/6th gravity chair and multi-axis trainer, design, build and launch a team rocket, learn teambuilding skills, construct a heat shield and build a rover. Sara had to answer three essay type questions as part of her application to the camp. The first question asked what the applicant hoped to gain from the space camp program. The Grade 12 student at St. Charles College in Sudbury, Ont., has close to perfect grades. Sara has received early acceptance to the Chemical Engineering and Forensics programs at a couple of universities in the province. Once Sara walks into her chosen post-secondary institution, she’ll be helping to improve the statistics in two areas: First Nation education, and women in math and science. According to Statistics Canada, women are underrepresented in science, technology, engineering, mathematics and computer science (STEM) fields, making up only 22 per cent in the field. Sara’s physics teacher, Tim Kingshott, is the Science department head and Senior Physics teacher at St. Charles College. He recognized Sara’s affinity for the science. Kingshott got to know her during the two years he’s been teaching Sara. Kingshott admires the way her mind works. “Basically, she seems able to not get stressed out. Sara’s able to take problems she gets and compartmentalize them by breaking them down into individual tasks. Then she goes about solving them. She doesn’t worry about the quantity of work that needs to get done,” he said. Shows like Crime Scene Investigation (C.S.I) have sparked Sara’s interest in the field of forensics, which is where she wants to end up. With her nose to the grindstone and her eyes set on the stars, Sara is heading to Space Camp for a week this spring and travel to Japan is in her future. Employed part-time at a coffee shop, Sara has already started saving for her trip to Japan and has plans to learn the language.